After moving to Oklahoma City in 1958, Finnish immigrant Pearl Palo became very active in the community, giving back and volunteering her time to help out various programs through her church. Following her death, a charitable bequest in her estate created an endowment fund at the Oklahoma City Community Foundation that will forever benefit the community. Pearl Nieminen Palo was proud to be the daughter of Finnish immigrants. A native of Chicago, Pearl, known to her family as Helmi, graduated from Northwestern University. She taught high school English and French before moving to Oklahoma City with her husband, Ernie. 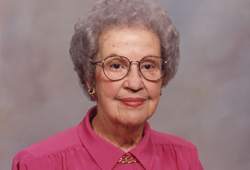 Once settled in Oklahoma City, Pearl became very involved with her church, First Presbyterian, where she initiated a social program for seniors and an afterschool tutoring program. She also taught French at Hoover Middle School. Both she and Ernie were enthusiastic amateur photographers and were active in the Oklahoma City Camera Club. Pearl remained proud of her heritage throughout her life; the couple and their two daughters frequently hosted Finnish students and visiting dignitaries. Pearl died in October of 2009. When her estate was settled in August of 2010, the Oklahoma City Community Foundation received a gift that established the Pearl Palo Fund that will benefit several charitable organizations designated by Pearl. Through a charitable bequest, you can designate a percentage, the residual or entirety of an estate to either create an endowment or make a gift to a charitable organization. We offer sample bequest language for either a will or a trust. For more information contact Kenneth Conklin, at 405/606-2926.